McCulloch, a power equipment brand owned by Husqvarna, creates all kinds of lawn equipment. One piece of equipment McCulloch makes, the line trimmer, requires a string that is heavy-duty. It is not expensive to change the string, however; it takes only a few minutes to replace. Any line that is size .095 or .080 will work as long as it is placed into the trimmer properly. When storing a weed trimmer, do not wrap up the exposed line. Lay the trimmer on the ground. Locate the trimmer head at the bottom of the shaft. Turn the trimmer head knob counterclockwise to pull out the spool. Remove any debris from inside the head and spool. Cut a 14-inch piece of trimmer line and fold it in the center. Place one of the ends in the bottom notch on the spool. Wrap the first 7 inches of the string around the bottom half of the spool in a clockwise motion. Wrap the second half of the string around the top half of the spool, which is indicated by a plastic divider, in a clockwise motion. Connect the open end of the line through the spool's top notch. Place the spool against the spindle in the center of the trimmer head. Feed the ends of the line that are through the spool notches through the eyelets in the trimmer head. Push the spool down onto the trimmer head's spindle. Pull the line tight with your hands. Tighten the spool on the head by twisting it clockwise. 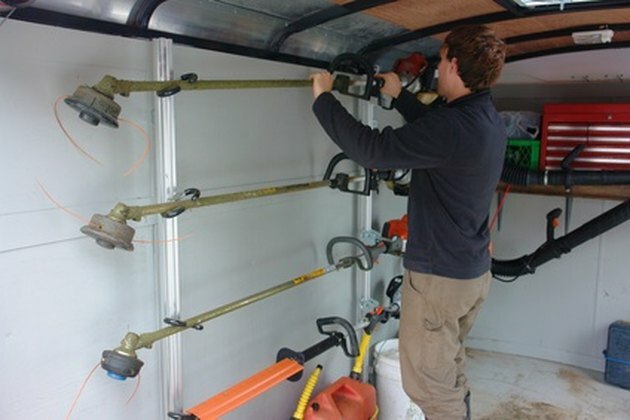 What Size String Does a Stihl Gas-Powered String Trimmer Use?